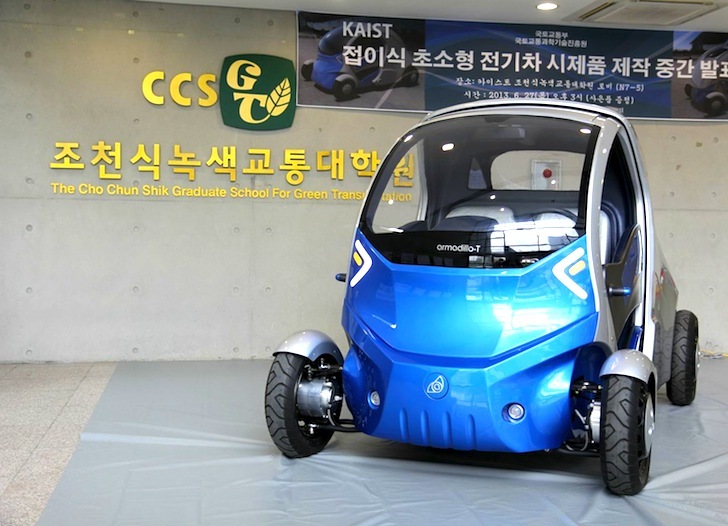 KAIST Unveils Folding Electric Micro Car That Can Fit Into Any Parking Space! A team of Korean researchers just unveiled a tiny electric vehicle that can fold down to 5.24 feet – which is one third of the space that makes up a standard parking spot! Urban centers around the world are set to become increasingly polluted and crowded as populations explode and people flock to cities. In response to the need for smaller, compact and clean-running vehicles to mitigate the environmental harm and personal discomfort that comes with overcrowding, a team from the Korean Institute of Science and Technology (KAIST) built the Armadillo-T to roll up into its shell – quite like the South America animal does when it is threatened. Weighing in at just under 1,000 pounds, the Armadillo-T is no speed demon. It maxes out at roughly 38 mph, though it can travel 62 miles with a 10 minute electric charge. 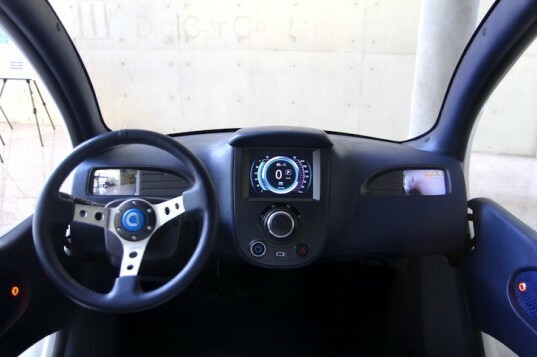 A two-seater, four-wheel-drive, all-electric vehicle, this tiny car folds down from 9.2 feet to just 5.24 feet with a remote-controlled smartphone interface, reports Physorg. This is possible in part because the 13.6 kWh lithium-ion battery pack is located in the front of the vehicle and all four of its motors are tucked into the wheels. As a result, neither has to shift when the car folds down to fit snugly with two other cars in a standard parking spot. “I expect that people living in cities will eventually shift their preferences from bulky, petro-engine cars to smaller and lighter electric cars. Armadillo-T can be one of the alternatives city drivers can opt for,” says Associate Professor In-Soo Suh from the Graduate School of Green Transportation at KAIST. Ideal for urban environments and short trips, this little vehicle would be great for car-sharing programs. If the price were right, would you buy one? A team of Korean researchers just unveiled a tiny electric vehicle that can fold down to 5.24 feet - which is one third of the space that makes up a standard parking spot! Urban centers around the world are set to become increasingly polluted and crowded as populations explode and people flock to cities. In response to the need for smaller, compact and clean-running vehicles to mitigate the environmental harm and personal discomfort that comes with overcrowding, a team from the Korean Institute of Science and Technology (KAIST) built the Armadillo-T to roll up into its shell - quite like the South America animal does when it is threatened.